Khabib on Conor McGregor: "He thinks his whiskey is going to help him?" As if the UFC 229 press conference with Khabib Nurmagomedov and Conor McGregor did not already have it’s share of highlights, there was one moment in particular that caught everybody’s attention. Most recently, Conor McGregor has been involved in other business ventures while away from MMA, most notably coming out with his own brand of whiskey. Throughout last night’s presser, at every moment possible, McGregor would take a moment to promote his product. Nurmagomedov of course, was not impressed by his tactics. 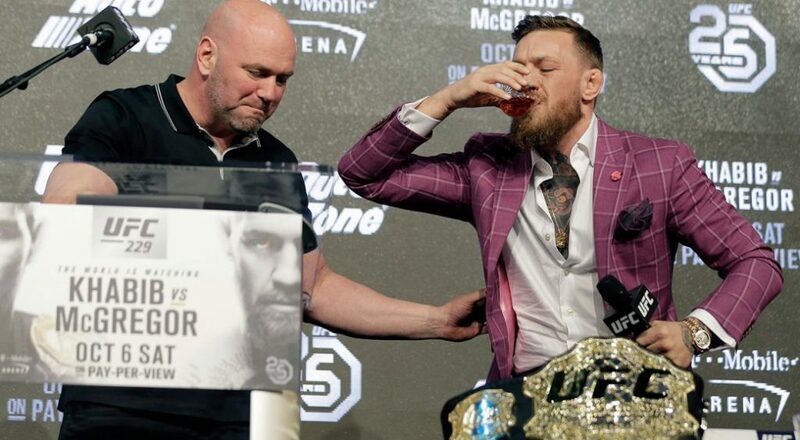 “I never drink this sh*t,” the Russian responded, pushing a glass away, when McGregor offered him a measure of the whiskey during the press conference. McGregor then began speaking about his whiskey once again, only this time, he was interrupted by Nurmagomedov. “Okay, what are you doing here?” the russian asked during McGregor’s promotional speech of his whiskey. McGregor stated he laughed at Nurmagomedov’s even from the lock up performance in Brooklyn, The Eagle then responded by claiming he is the sport’s most dominant champion present day. “I am the Floyd Mayweather in MMA. Right now, I am most active and dominant UFC champion. This is my third fight in last nine month. 26-0, never lose round. I don’t know what this guy is talking about. I don’t know what he gonna do 6th of October,” he said.